Sin doesn’t just “happen.” Sin begins, not with an action, event, or shout, but a whisper. There use to be a commercial that started with, “When you want to get someone’s attention, you whisper.” If you have ever tried lowering your voice, rather than raising it, you know how effective whispering can be. Sin wants to get our attention and does so subtly. I know the Psalmist refers to the wicked, but I am not immune from the whisper of sin. Sin’s whisper takes a hold of my heart, creating a life of its own. Sin’s icy grip closes tight on my heart and I find myself “set on a way that is not good” (verse 4, NRSV) and my slow descent started with a whisper. Sometimes sin whispers doubts, sometimes desires, bringing envy, fear, jealousy, greed, lust, pride, thoughts and attitudes vying for my attention and control of my life. If sin would make some kind of frontal attack, I would see it coming, and, hopefully, be able to resist. Sin comes in slowly and quietly, not announcing its presence. Before I am even aware, sin has a foothold in my life. I don’t consider myself wicked, but I have heard the whisper of sin. I’m glad the Psalmist doesn’t end focusing on sin and the wicked. He raises his gaze and catches a glimpse of the vastness of God’s love. He sees God’s faithfulness, justice, and care. He recounts how God shelters us, feeding us from his abundance and great delights. He basks in the Fountain of life and the light by which we see! The Psalmist knows those who continue to listen to Sin’s quiet whisper will be set against those whose eyes are attentive to God. The wicked will continue to “lie awake at night, hatching sinful plots” never seeking to do good. Sin never takes a day off. God has already dealt with those bent on evil. The Psalmist celebrates their defeat! We can move forward knowing God prevails! We can move live abundantly knowing that Love prevails! Sin, however, will continue trying to get our attention. Throughout this day, sin will attempt to whisper in our heart, perhaps causing us to question the love of God. May you remain attentive to God’s goodness that surrounds you. When those, who give into Sin’s seductive whisper, try to “push” you around (verse 11) or trap you in their “sinful plots” (verse 4), may you find shelter in God’s unfailing love, finding delight in the One who is our “fountain of life, the light by which we see.” (verse 9). God has loved you deeply and continues to give you good things, blessing you over and over again. His love is deeper than the ocean and higher than the heavens. He continues to feed you from his abundance and delights. May God’s presence be your joy. The alarm buzzes with an intensity that shakes me from a dream of better things. I sluggishly jump out of bed heading to the alarm, wisely placed twenty feet from my bed, making sure I am definitely awake before I can turn it off. Another day has dawned. When I get up, I am not thinking “praise the Lord.” I’m only thinking of turning off the alarm. I have no idea what this day will bring; good or bad, both or neither. Even on the best of days, work remains undone when the evening comes. Much has happened, bringing me closer to my goals and, at times, moving me further away. Frustrations, joys, disappointments, excitement, despair, and unbridled hope coalesce into daily days. I can plan my day, but my day tends to plan me, or remind me that I’m not as in control as I pretend to be. I come home at the end of the day and fall into the chair, thankful that the day finally fades into night. Some evenings find me content, knowing tasks were finished, challenges addressed, and plans created. Other evenings find me wondering what went wrong and what I can do to get back on track. This verse captures me. I wonder about the Psalmist. When did David realize that throughout the day he was being carried? When did he recognize that through it all, whatever “it” might be, he was not walking alone, but actually being carried? Psalm 68 is one of deep praise. David saw the wonderful works of God, where I struggle to see. David also realized that God worked in his life. He knew God was caring him each day. He carries me as well…and you. No matter what your day, no matter how good, no matter how bad, no matter how close you get to your goals, no matter how many things get in the way and keep you from your objectives, you are carried in the arms of God. 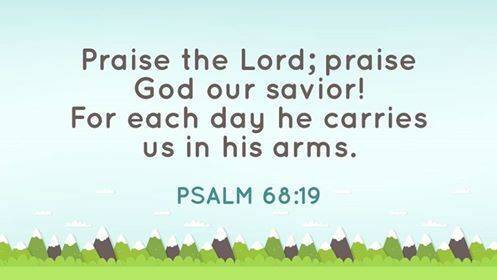 May this day be a day of praise as you remember you are carried in the arms of a loving God.